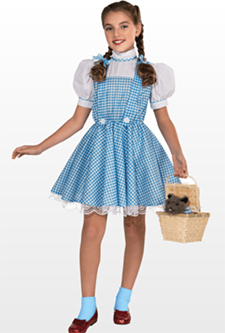 If you're off to see the wizard, the wonderful Wizard of Oz, this Book Day, then you'll love this official Dorothy fancy dress costume. Feminine and iconic, this costume is perfect as 'The Wonderful Wizard of Oz' began life in 1900 as a childrens novel before the film version came out in 1939. The outfit is available online for £19.95 in three sizes - small (age 3-4 years), medium (age 5-7 years) and large (8 - 10), and comprises of an all-in-one blue and white checked gingham dress with white under top. The top has short sleeves which are slightly puffed and features a line of gingham trim around the arm and neck line. The apron style front to the dress has gingham straps and button detailing. To complete the look you could add a Toto in a basket, white ankle socks and sparkly red shoes.